Relations between Australia and India have advanced impressively over the past decade. Yet in some ways the ties between these two democracies have continued to fall short of their great potential. This state of affairs provided the background for a major dialogue held in Sydney in late 2011. The Lowy Institute for International Policy and the Public Diplomacy Division of the Indian Ministry of External Affairs are proud to release the summary of proceedings and outcomes report for the latest Australia-India Roundtable, the most substantial informal dialogue yet held between the two countries. The dialogue was supported by the Australia-India Council. Amid a time of dramatic strategic and economic change, Australia and India need closely to coordinate their diplomacy and policies to protect and advance common strategic interests in their shared Indo-Pacific region. Enhanced Australia-India defence, maritime and security ties should be embedded in a wider regional diplomatic architecture that takes account of and builds on the two countries’ ties with other key partners. Practical maritime cooperation should take place in areas like humanitarian assistance, disaster relief and oceanography. Energy security will be central to the bilateral trade and investment relationship. Recent growth in mining investment in both directions, such as major Indian coal mining and infrastructure investments in Australia, is a positive sign. Australia and India need to do more to make the most of convergent interests in security, economics and social development, a major Australia-India dialogue recommended at its conclusion on 20 September 2011. The dialogue called for ‘inventive steps’ by both governments to bring about a closer strategic and economic partnership between the two democracies for the Asian century. More than 50 leading figures from diplomacy, think tanks, business and media took part in the two-day Australia-India Roundtable, held at the Lowy Institute for International Policy in Sydney. The Roundtable – an innovative composite dialogue involving both government and non-government participants – is the most substantial and high-level exchange of its kind held so far between Australia and India. It was hosted by the Lowy Institute for International Policy in partnership with the Public Diplomacy Division of the Indian Ministry of External Affairs. It was supported by the Australia-India Council of the Australian Department of Foreign Affairs and Trade. • and ways to improve and manage perceptions between the two countries including in the aftermath of the controversies over the welfare of Indian students in Australia. • Amid a time of dramatic strategic and economic change, Australia and India need closely to coordinate their diplomacy and policies to protect and advance common strategic interests in their shared Indo-Pacific region. Both nations have an interest in a rules-based regional order, the security of the maritime commons and freedom of navigation. The two countries should work to together to lead in strengthening multilateral cooperation in the Indian Ocean region, including through the Indian Ocean Rim Association for Regional Cooperation. The two countries should consult closely on their approaches to South Pacific and Indian Ocean issues. • Enhanced Australia-India defence, maritime and security ties should be embedded in a wider regional diplomatic architecture that takes account of and builds on the two countries’ ties with other key partners. Practical maritime cooperation should take place in areas like humanitarian assistance, disaster relief and oceanography. • Energy security will be central to the bilateral trade and investment relationship. Recent growth in mining investment in both directions, such as major Indian coal mining and infrastructure investments in Australia, is a positive sign. The Australia-India partnership would benefit greatly from a more comprehensive energy relationship. Coordination of the two countries’ research in solar energy could be advanced using the large bilateral strategic research fund. • The bilateral trade and investment relationship has grown rapidly and holds enormous promise, but needs to broaden and diversify beyond commodities trade, and move towards a more balanced trading relationship. • The two governments should create structures to assist large-scale direct collaboration between services companies in the two countries. The creativity of small Australian IT service-sector companies could be combined with successful Indian models for growing such businesses and exporting them to the world. Joint export of services to third countries should be a long-term goal, as part of a future global supply chain in IT services. • Education links would remain an important element of the bilateral relationship, in research as well as in study opportunities. • The two nations need actively to work to improve mutual perceptions and understanding including among media, parliamentarians and public opinion. Engagement between the two societies is growing rapidly and positively including through migration, education, business, tourism, sport and culture. Participants strongly agreed on the value of the Roundtable in advancing Australia-India relations, bringing government and non-government voices together to raise awareness and build a broad agenda of cooperation. The convening organisations have agreed to holding another round of the talks in India in 2012. Visiting Indian participants include Deputy National Security Advisor Ms Vijaya Latha Reddy, former Indian Foreign Secretary Shyam Saran, Chairman of the National Association of Software Service Companies (NASSCOM) Dr Rajendra Pawar, the Director General of Research and Information Systems for Developing Countries Dr Biswajit Dhar, leading strategic expert Dr C. Raja Mohan, Commodore Uday Bhaskar of the National Maritime Foundation, prominent television host Karan Thapar and Navdeep Suri, Joint Secretary of the Public Diplomacy Division of the Ministry of External Affairs. 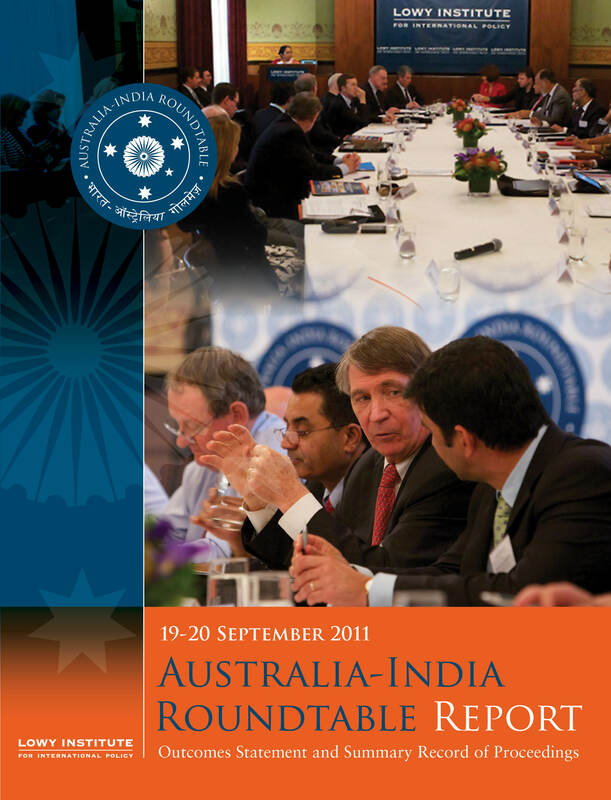 Australian participants include former High Commissioner to India and Chairman of the Australia-India Council John McCarthy AO, former Chief of the Defence Force General Peter Cosgrove AC MC, former Secretary of Defence Ric Smith AO, former Foreign Secretary Michael L’Estrange AO, National Chairman of the Australia-India Business Council Professor Arun Sharma, Reserve Bank Board Member Dr John Edwards, University of New South Wales International Pro-Vice Chancellor Jennie Lang, General Secretary of the Australian Labor Party (New South Wales Branch) Sam Dastyari, Lowy Institute executive director Dr Michael Wesley, Lowy Institute program director and the Australia-India Roundtable’s Australian convener Rory Medcalf, a range of senior government officials, and media commentators.